Louis Belluomini’s life changed when he was paired with a spirited, sandy-colored service dog named Star. Sixteen months later, he’s working to change the lives of fellow veterans, medics, husbands and dads who are toughing through the effects of post-traumatic stress disorder (PTSD) with no improvement in sight. The now 2-year-old Labrador/golden retriever mix has quieted Belluomini’s symptoms where medications failed, and has launched his handler onto the national advocacy stage. Between 24-hour shifts as a paramedic and helping his wife raise their young son, the Findlay man is lending his personal testimony to newsletters, documentaries, essays and speaking engagements, all in the hopes of changing the ways society and employers view service dogs. To the knowledge of Belluomini and the many advocacy agencies with which he’s affiliated, Star is the only service dog to ride on an ambulance in this country. After collaborating on a 12-page publication and a short film with the NW Disability Action Center-Idaho last fall, Belluomini heard from first responders across the nation who are struggling to gain their employers’ blessing to bring their service dogs to work. One, a New York City firefighter who was in Tower Two when it collapsed on 9/11, has a service dog to help treat his resulting PTSD, and is prohibited by the city of New York to bring his dog to the station. Stories like this have increased Belluomini’s resolve to become a model for how service dogs can blend seamlessly into the everyday lives of their handlers, no matter the setting. When it came time to interview for a job at the Putnam County Office of Public Safety, Belluomini naturally took Star along with him. She accompanies him everywhere, after all, including the part-time job he already had with Hanco EMS. EMS chief Nancy Erhart didn’t even bat an eye: “I like animals, but I don’t think that would have affected my decision either way. Louis is a good medic,” she says. And Star has proven her worth, not only to Belluomini but as an honorary paramedic. When she was new to the job, the simple command “load” would get her into the squad and in the seat specially designated for her. These days the dog doesn’t even need to be told. When her handler gives the command “go to work,” Star knows it’s time to put on her special firefighters’ turnout jacket, complete with Putnam EMS patch and another that reads “WORKING DOG, DO NOT PET.” In the vest’s pockets are important medical devices like Ace bandages, a tourniquet and IV kit, along with more practical items like a lint brush and a bottle of hand sanitizer. She is trained in search and rescue and, if a patient so desired, could act as a comfort dog during a nerve-racking ambulance ride. “When you bring a dog into this environment, especially, it relaxes people,” Belluomini says, adding the same goes for his co-workers. 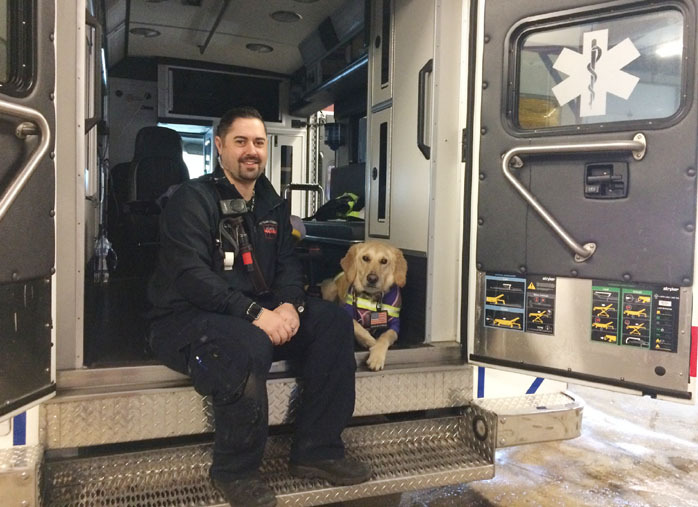 Star bounds into the office every morning to greet Erhart, and Belluomini says “everyone’s face pretty much glows” when the pup strolls into the ambulance bay to work her shift. More importantly, though, is the effect she’s had on her handler. Belluomini was honorably discharged from the U.S. Army as a captain after serving in Iraq and Afghanistan. He was diagnosed with PTSD in 2016 after attempting to hide his condition for over five years. Studies show that PTSD, depression and suicide run rampant in the lives of first responders, too, be it police officers, firefighters or EMS crews. According to a 2015 article published in the Journal of Emergency Medical Services, a survey of more than 4,000 first responders found that 6.6 percent had attempted suicide — more than 10 times the rate in the general population. Belluomini’s condition presented itself as nightmares and dangerous behaviors while sleepwalking. During the day, the trauma was exacerbated by the “tough guy mentality” expected of medics and first responders no matter what horrific scene presents itself. He and his wife, Jessica, learned of the nonprofit agency K9s for Warriors which pairs service dogs with military heroes and decided to give it a try. He was paired with Star who, within 10 days, was lying on his bed to stop him from sleepwalking or pawing him awake from nightmares. Star now accompanies her handler everywhere, providing 360-degree cover in public spaces and a sense of protection and comfort he hadn’t felt in years. She became a part of his family and serves as a constant playmate for the couple’s 15-month-old son, Silvio, and has earned a special place in Jessica’s heart, too. Star also sparked in Belluomini a determination to dedicate himself to changing people’s attitudes toward mental illness and policies regarding service animals in the workplace. Belluomini will be speaking on PTSD and service dogs during a Life Flight conference Feb. 9 at Kalahari resort in Sandusky, along with an upcoming Heelers for Heroes event in Toledo. He is also associated with a new mental health initiative in northwest Ohio known as S.H.Y.A.A., which aims to create a network of motivational speakers for those living with any number of mental illnesses. He feels proud to serve as a success story for K9s for Warriors and to embody the capacity for healing envisioned by founder Shari Duval. He is even more proud, though, of having made the effort to get better for the overall health of his young family. “My wife has been my rock through all of this and has been very supportive in everything we try to do in helping others. I couldn’t be at this place in my life without her and she has truly been the best partner I could ask for,” he says.